Jim and Judi Herbert, both UT alums, challenged the UT community to raise $500,000 during the Big Orange Give, November 8, 2017. The reward? An additional $500,000 to help us meet the $1 million goal. Thanks to the generosity of our Volunteer community, we exceeded the $1 million goal and the Herberts designated their challenge gift to the Writing Center. Growing up, Judi loved to read. She was also good in math and science, however, and scored high enough on entrance exams that it looked like she was headed in that direction. Over the years, Judi has continued to work with college students, but she has noticed a disturbing trend. Recent college graduates do not have good writing skills. Judi and Jim (’62) met with people from the Writing Center and decided their support could help expand the reach and impact of the Center not only for freshman taking an English course, but for students in upper-level courses in different majors, as well as graduate school. Kirsten Benson, director of the Writing Center, says the Herberts’ gift will make a big impact on the number of students the Center serves. The Herberts’ generosity will also make it possible to expand the services offered in the Writing Center, including the kind of help offered to upper-division students who are not English majors. 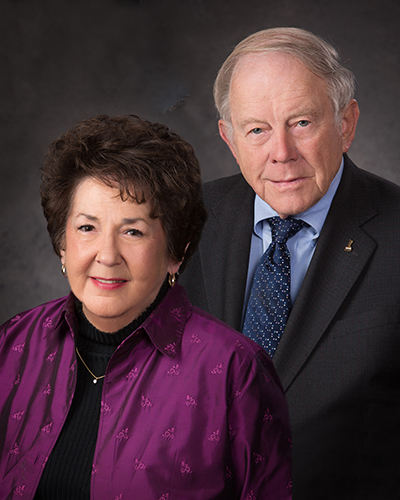 Jim and Judi Herbert are excited to begin their journey of support for the Writing Center and to give back to the university.